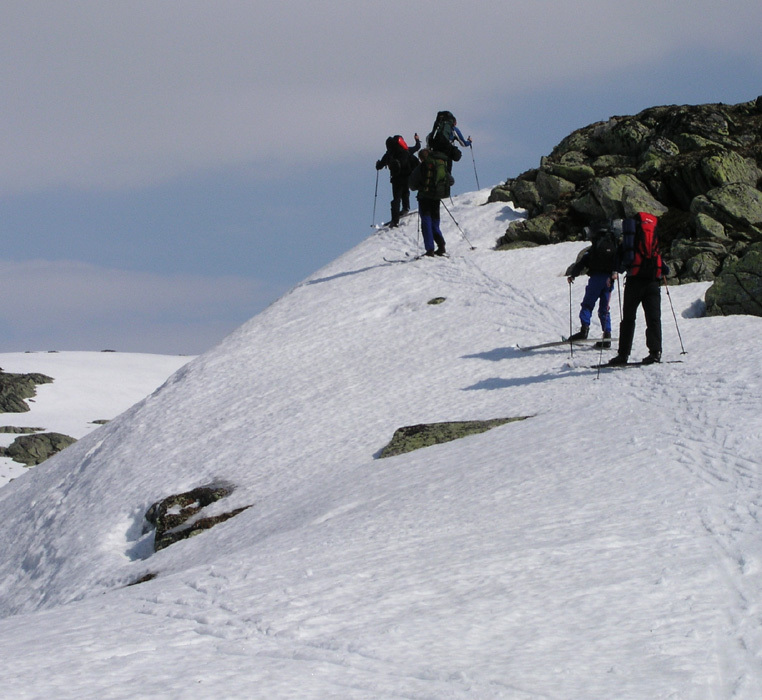 How to get there: This route, called the Meneseggi to Jostefonn traverse, is a classic high ridge route, normally done on skis in the spring. In all, eight mountains are traversed. This description will link the route across these mountains. 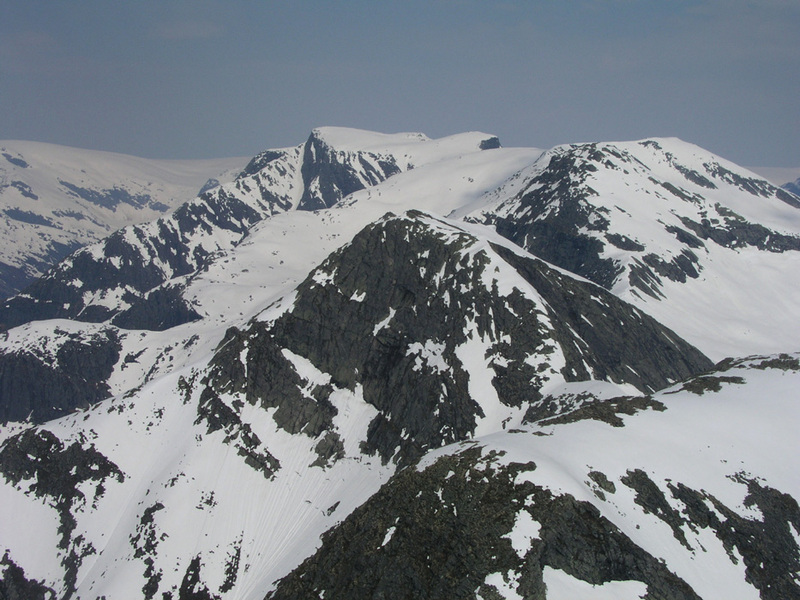 The route starts at the Meneset, the point where this ridge hits the Sognefjord between the two (north-going) fjords Fjærlandsfjorden and Vetlefjorden. The best approach from Bergen is via Voss and across Vikafjellet to the ferry at Vangsnes. This ferry crosses to Hella and connects directly to Dragsvik, From Dragsvik, drive north (about 15 km) along the fjord, just as you reach the northenmost end of Vetlefjorden there is a small road going left with a sign saying Menes 5.4 km. Turn onto this road and drive to the tip of the penisula where the road has a rather sharp left curve. Find parking here off the road. The GPS location is North 61:15.236, East 006:34.414. Route description: Head directly up the hill, more or less along the ridge. The trail starts a bit on the east side, however, you will hit the trail higher up as long as you do follow an ascending path perhaps going slightly right (east). The trail is quite well developed and easily followed. 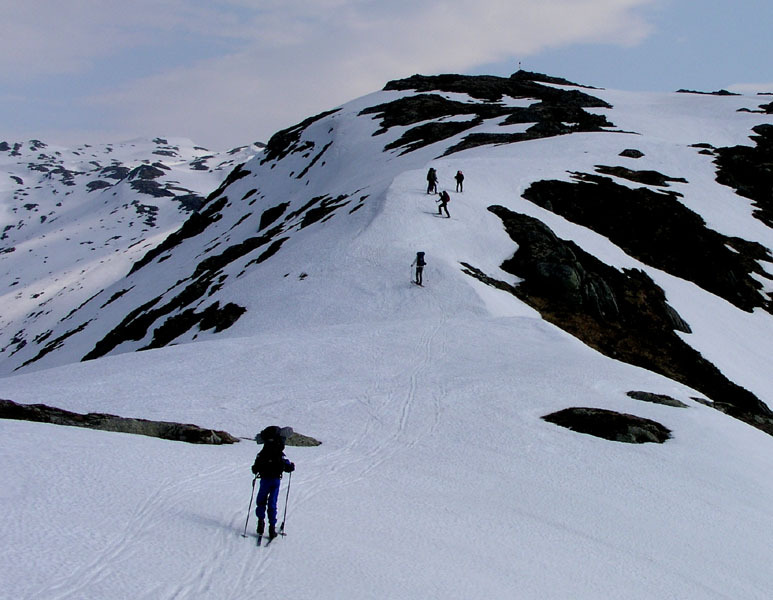 Stay on the trail as it climbs the ridge until you close in on a power line that crosses the fjords on either side. From this point, it may be best to head slightly left and gain the highest ridge, this way you have a very nice view both east and west into the two fjords. 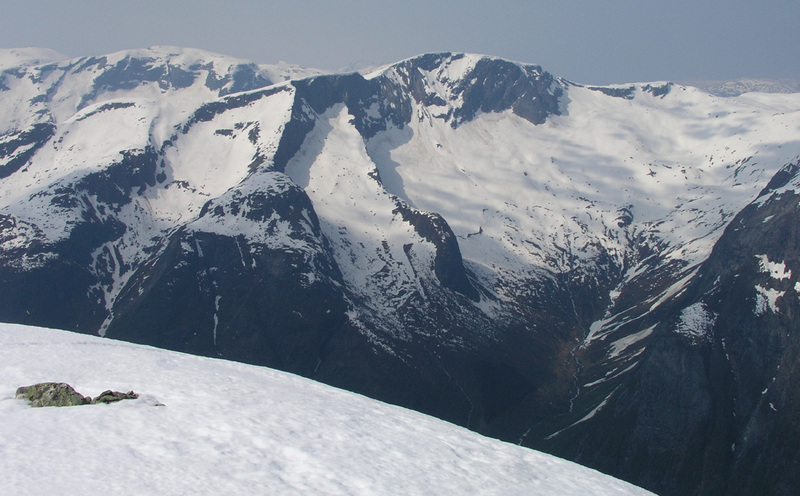 The ridge becomes more distinct, but never airy as you continue the climb towards the base of Harevollsnipa. The peak itself is easily climbed (on skis) directly up from the south side. The route to this point is (YDS) class 2. The description of the traverse now continues under Saueggi. 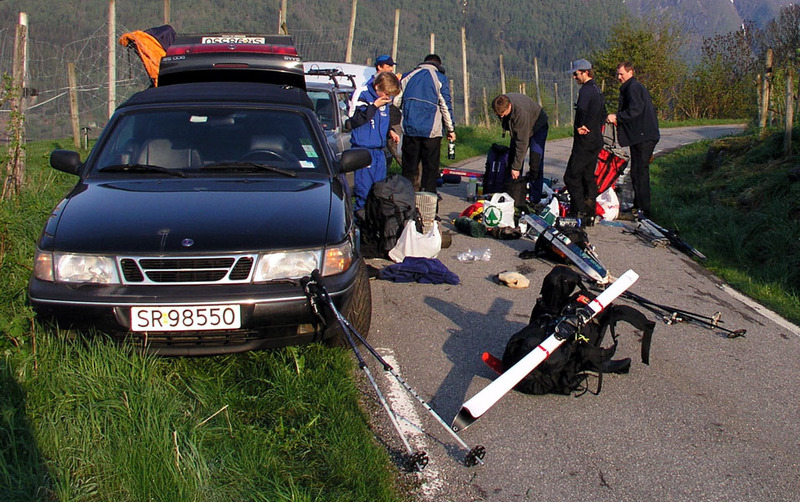 Comments: This was a trip organized by Bergen Turlag, Fjellsport (Mountaineering Group). The trip leader was Per Ove Oppedal, who would come along on the trip to Greenland that would start the week after. 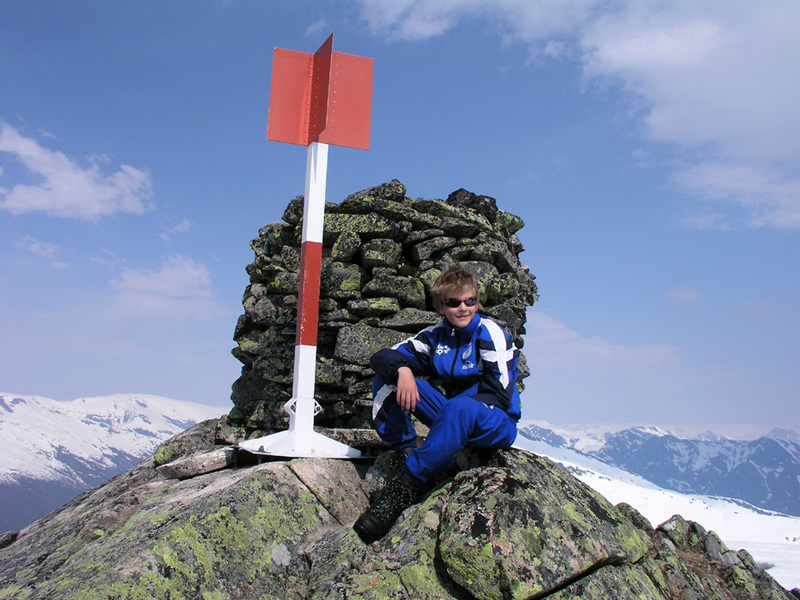 My son Pål Jørgen (age 15) would come along, as well as another Greenland participant, Arnt. The other participants on this trip were Jørgen, Ole Jacob and Bjørn. We started from the road a bit before 0800 and reached the summit of Harevollnipa at 1300, 1400 vertical meters behind us. Meneseggi, as seen from Storholten on the opposite side of the Fjærlandsfjord. Early morning, gear is sorted out before the start. View west. Vetlefjorden with the small branch Sværafjorden. The ridge is getting more distinct. We have started skiing. 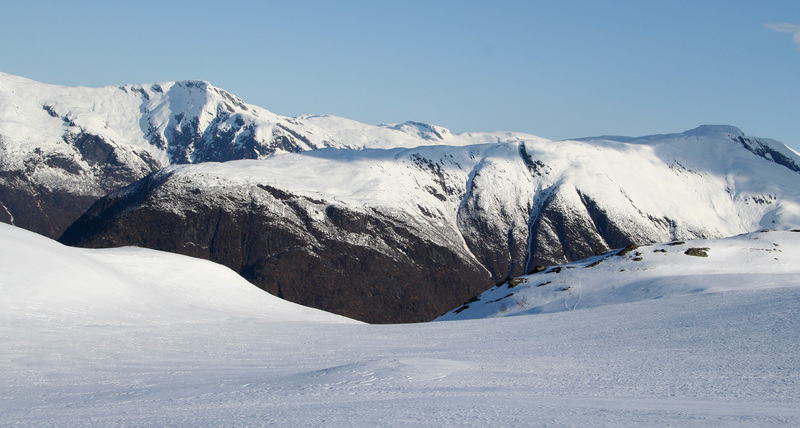 View east, across the Fjærlandsfjord. The ridge on that side is another interesting route. Harevollnipa, the route descends on the right side. View east, a very impressive ridge. Zoom east, in between, the fjord is 1400 meter below. Pål Jørgen on the top of Harevollnipa. The high ridge continues this way, when seen from Harevollnipa.